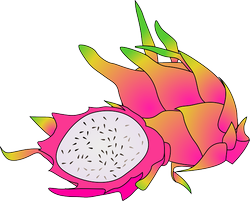 Pitaya fruits or dragon fruits are produced in a cactus plants which can be easily grown from vine cuttings. It is a good climber with aerial roots which helps the plant to grow higher and farther. 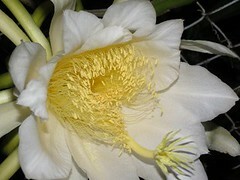 It blooms at night and has beautiful white colored fragrant flowers. The fruits are mainly harvested in August and September. They are also planted as ornamental plants and indoor plants. If you look at the plant and its flowers, you can see that they resemble dragons. I guess this is how they got the name.Today these plants are mainly cultivated in Thailand, Philippines, Bangladesh and Sri Lanka. 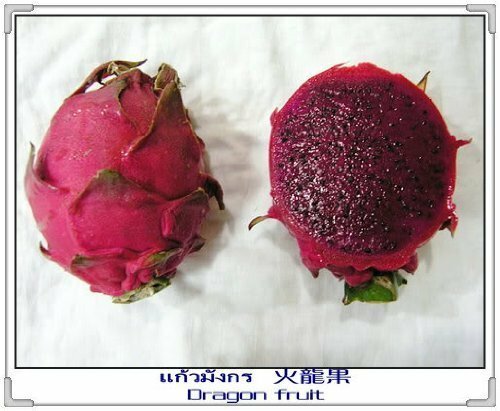 Here you can see images for the dragon fruit plant and its flower. Don't you think this cactus grow like dragons? As I mentioned above these plants are usually grown from vine cuttings, but it is also possible to germinate the seeds. 1. Hylocereus Costaricensis are fruits with red skin and red flesh. 2. Hylocereus Undatus are fruits with red skin and white flesh. 3. Hylocereus megalanthus are fruits with yellow skin and white flesh. The skin of an unripe dragon fruit will be green and as they ripe, the color changes to either red or yellow depending on the variety. It has tiny, crunchy seeds and it will be soft when it ripens. The texture of a ripe dragon fruit is much similar to that of a ripe kiwi fruit. If the fruit is firm or green in color, it is not ripe. If the stem of the fruit is brown or brittle and if it has got many blotches on the skin, it is overripe. If you like to grow dragon fruit cactus, know that the fruits should be picked from the plants only when they are almost ripe. Once the fruits are picked they do not ripe anymore. Dragon fruits normally ripe with 30 to 35 days after the flowers have bloomed. Dragon fruit cactus can absorb nutrients from the air, they are epiphytic. Still they grow roots and the vine cuttings can be easily planted in soil. It is best to plant them during the summer months. They usually take two years to produce flowers and fruits. The plants need good exposure to sun for flowering. If the plants are grown in containers, you can bring them inside during the winter months to avoid exposing them to freezing temperatures. You can use 10 to 15 gallons pots for growing these plants. They are best grown in dry lands since they doesn't require much water to grow. If the soil retains too much water it is not good for the plants. 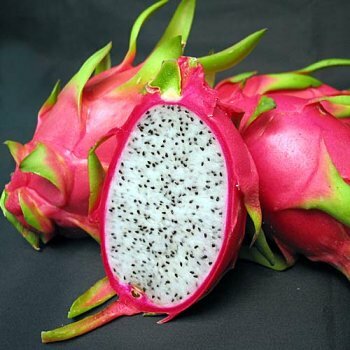 The ideal temperature for growing dragon fruit plants are between 65 to 80 degrees Fahrenheit. Mulch can be used as a protective covering for plants growing outside during winter. Why dragon fruits are called superfruits? Dragon fruits are full of fiber, vitamins, minerals, antioxidants and other nutrients required for the healthy functioning of human body. Since they are full of fibers, they aid digestion. 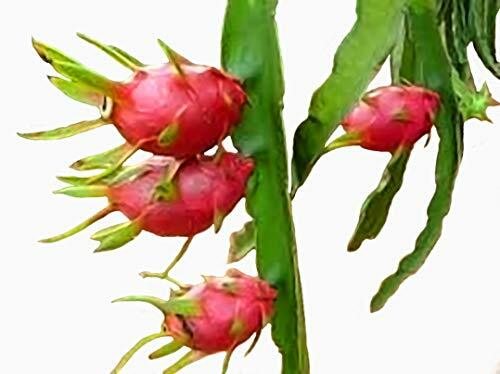 It is also believed that dragon fruits help regulating the blood sugar in Type 2 diabetic patients and hence they are prescribed to diabetic patients in Taiwan. They have very high levels of vitamin C which is good for our immune system. Dragon fruit also helps to regulate cholesterol and it is good for cardiovascular health. Dragon fruits or Pitayas are mildly sweet with a nutty flavor and their seeds are edible. The creamy flesh can be easily scooped out using a spoon and can be eaten raw or used to make fruit juice. They can also be used to make jams, sorbets, smoothies or wine. Sundried Dragon fruit slices are made from the sweeter red variety. The crunchy dragon fruits chips are made using the Vacuum Freeze Drying Technology and the product contains 10 packs of chips. The antioxidant infused dragon fruit beverage contains 12 packs of 18 ounce bottles with 1 gram of sugar per serving. 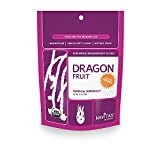 AMBIPUR CAR Air freshner Refresh your car Fresh Thai DRAGON FRUIT 2 ml. Experience the taste and smell of paradise! Labello Dragon Fruit Lip Balm combines rich almond oil, jojoba oil and shea butter to keep your lips as soft and fresh as they can be. Do you like Dragon Fruits? Thanks for commenting EmmaSRose and Rose! @EmmaSRose They are definitely refreshing fruits and good for health too. @Rose, You can mostly find them in Asian markets, hope you will find it! I'd love to try one, but I don't think I've ever seen one in the supermarket. Thank you all! Yes I agree they look beautiful as well as tasty. Like any other fruits brought from market, they may not retain the original flavor or sweetness due to things like artificial ripening. So it is worth growing the plants by your own, if possible. I have updated the article with a youtube video which will help you understand the basics of growing dragon fruit plant. Have a look when you have time. @ologsinquito, thank you so much for the pin! VioletteRose, Dragonfruits are as pretty on the outside as on the inside. There's something about anything reminiscent of dragons that is irresistible. I've tried dragonfruit but it wasn't very sweet. I might try to grow it myself and then I can really pick them when they are just right! I've seen them but didn't know what they were. This article was incredibly informative. I didn't know that plants could absorb nutrients from the air. I'm pinning this to My Wizzley Writing Board. I've never heard of dragon fruit before. They look tasty.